Turner Law Offices, P.C. 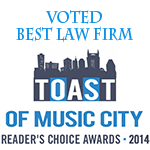 has won Best Law Firm in 2014 Toast of Music City Reader’s Choice Awards. Thanks to all of our loyal clients who have made this possible. It means so much to us that we are nominated for best law firm by those who have used our legal services. When people need a lawyer, they are generally not in a good place. The fact that we can help our clients through the worst of times and have them nominate us for an award speaks volumes. Read all about us in the Tennessean article.